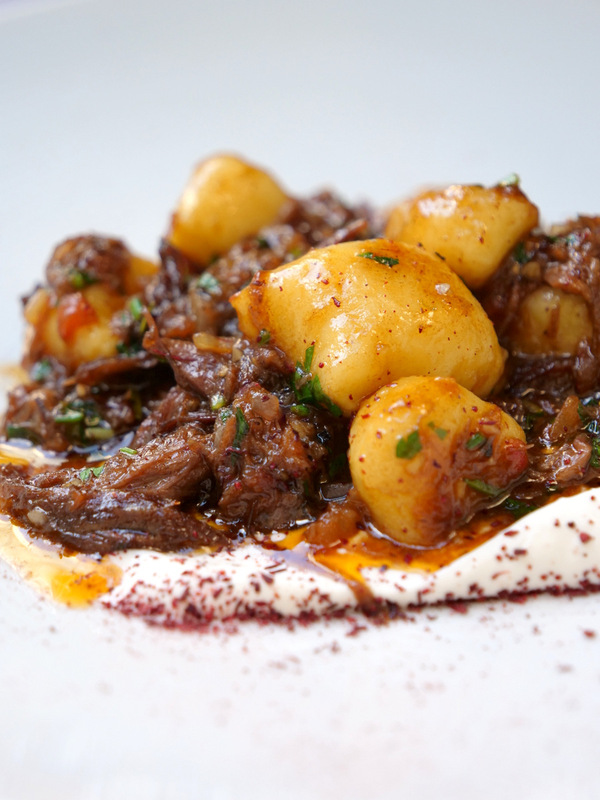 The Round Tables Festival in Israel is a three week food event where local Israeli restaurants are paired with guest chefs from visiting countries who takeover and cook at the local restaurants for a week. The Israeli chefs visit their counterpart chef in their country and learn how to prepare their signature dishes a few months before the event. 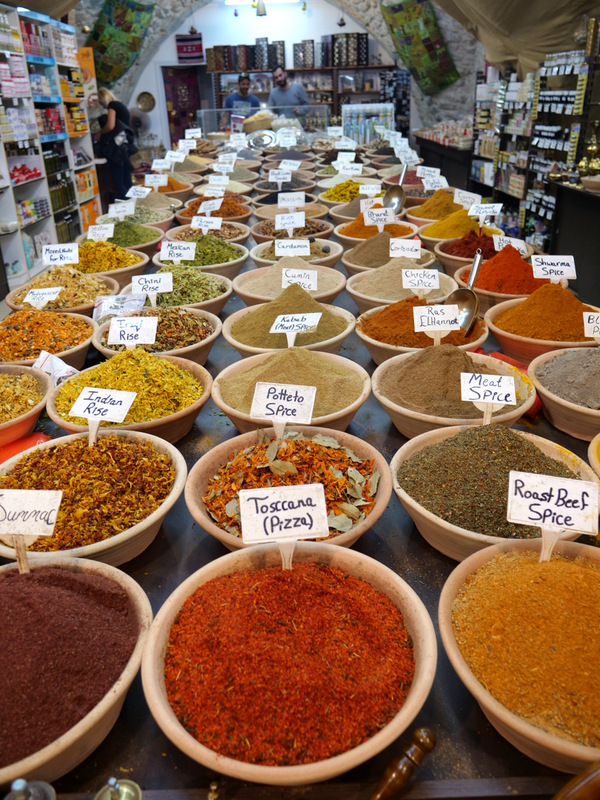 During the Round Tables tour, which takes place in November, the guest chefs and their teams come to Israel. 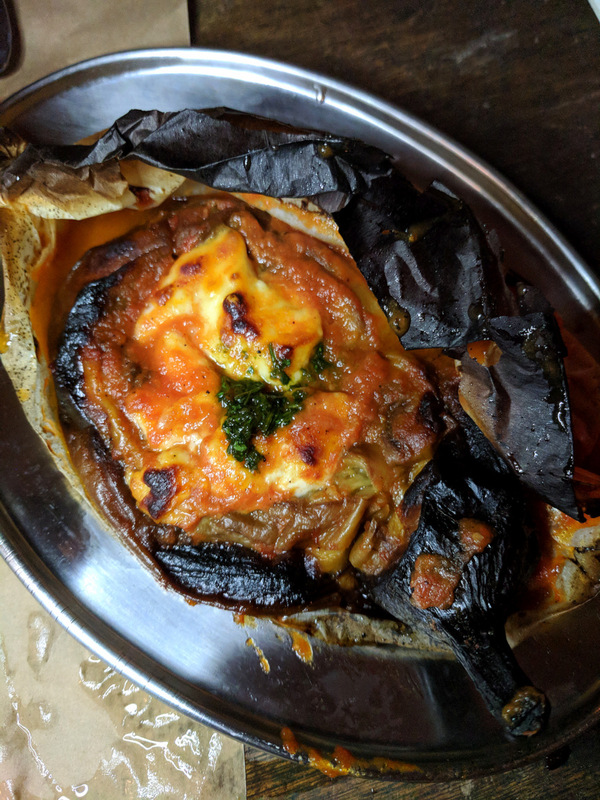 They prepare a menu that highlights dishes they usually served at their own restaurants and work with local chefs in Tel Aviv and Jerusalem to create a pop-up style restaurant takeover experience. This restaurant festival started in 2015 and has featured 35 top international chefs. The 2017 festival featured chefs from Italy, Spain, Peru, Mexico, US, Scotland, England, Belgium, Switzerland, and Denmark. 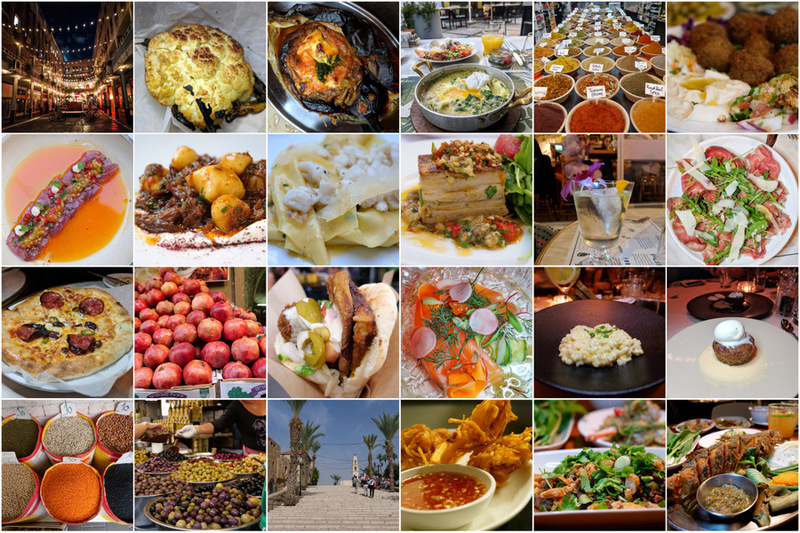 I visited Israel for the first time back in 2015 as part of a group of Latin/Spanish food blogger tour with Vibe Israel. Vibe Israel is a non-profit organization whose goal is to showcase and highlight the best of Israel: food, technology, wellness, travel, architecture, education, parenting, fashion, music, entrepreneurship, and more. The 2015 Vibe Comida tour was an unforgettable experience and opened the door to an exciting new food culture and long-lasting friendships. So, when I was recently invited back to visit Israel to cover the Round Tables festival as part of their newest Vibe Events initiative, I had to say yes. I’m so glad that I had the chance to return to such a unique country. Our first dinner in Tel Aviv was on Friday night at Romano Restaurant. It was a family style dinner to welcome the new chefs arriving, and a farewell dinner for those who had finished their week cooking at the Round Tables. Romano Restaurant is located inside a hidden courtyard in the historic Romano House building. Walking by the building from the street, you really would have no idea that if you open a barely marked door, and go inside you will find an open courtyard surrounded by a variety of restaurants and shops. 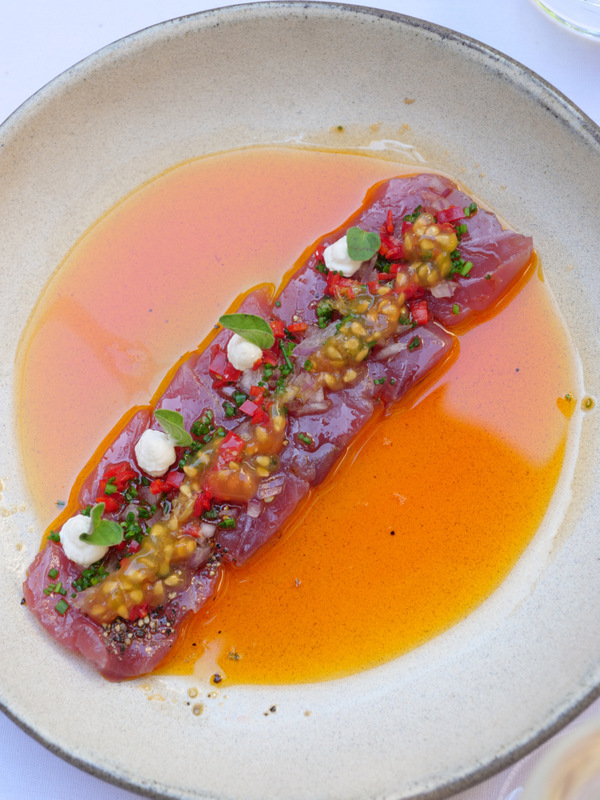 Romano has this cool vibe that mixes music and food in a casual but very trendy way. Romano is one of Chef Eyal Shani’s restaurants. We ate at his North Abraxas restaurant on the previous trip. I vividly remember having an intense conversation about his green beans with fellow bloggers on that occasion. 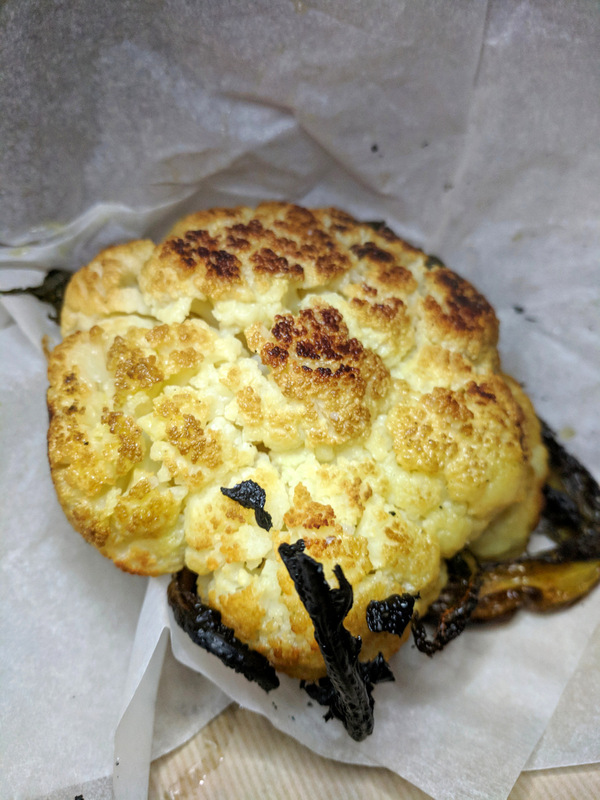 One of his most famous dishes is his roasted whole cauliflower. The roasted eggplant was one of my favorites at Romano. At most food events it’s usually the bloggers that are taking photos of the food, but when the roasted fish dish – presented on a huge metal platter – was brought to the table, the immediate reaction of all the guest chefs was to pull out their phones and snap a photo/video. One of the things that really impressed me on that first night was the bond that the hosting chefs and the visiting chefs had formed during their Round Tables experience. I’ve always loved how food brings people together and this took it to another level. The whole journey of the Israeli chefs visiting their international chef in their home countries, combined with the chefs and teams coming to Israel for the takeover – including dealing with the challenges of finding the ingredients needed for their dishes, plus experiencing the warm Israeli hospitality, definitely seemed that have created lasting relationships for all of those involved. I stayed at 65 Hotel, a contemporary boutique hotel that was perfectly located right on Rothschild Boulevard. The hotel accommodations were modern and very comfortable. One of the best things about the hotel was its generous and impressive breakfast buffet. 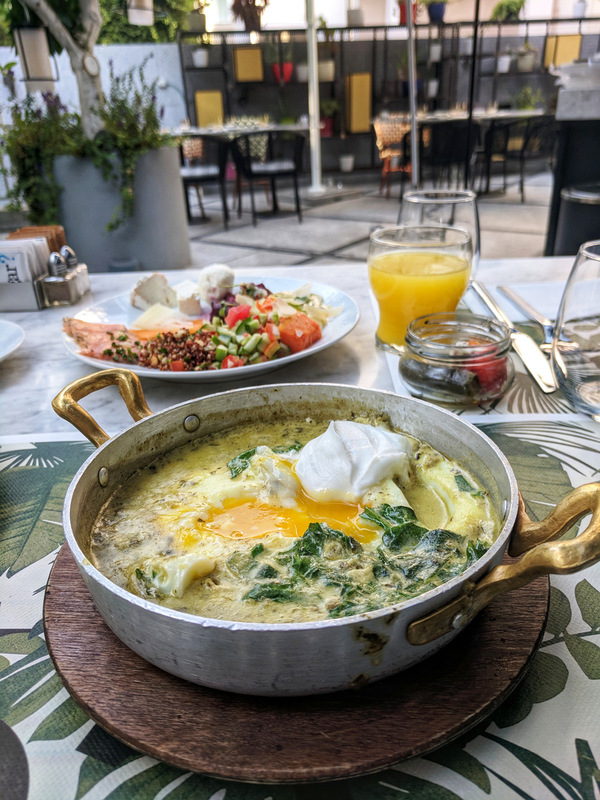 I particularly loved the green shakshuka for breakfast. They also offer an afternoon happy hour with free wine and snacks for hotel guests. The second day we drove to Jerusalem and explored the Old City before going to Mona Restaurant for lunch. Mona was going to be taken over the following night by Chef Simon Hulstone from The Elephant (UK), who joined us for lunch. I really enjoyed our lunch at Mona, we sat outside on the patio – surrounded by citrus trees, the drinks were great, the service was awesome, and the food was delicious. Some of the highlights included: special crab pasta, red tuna sashimi in chili oil, oxtail ragout, gnocchi with lamb, beef tartare, and the pork belly. 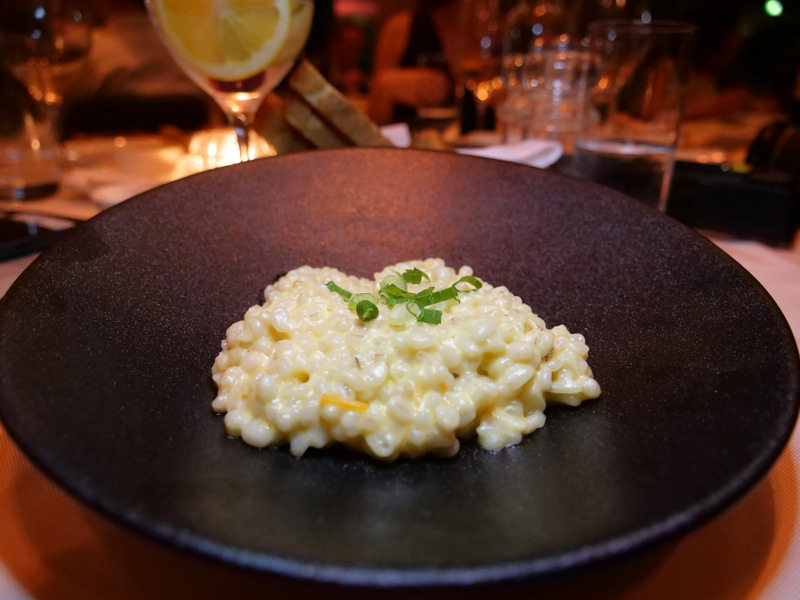 We also got a peek at the menu that Chef Simon was going to be preparing for his takeover, and I would say that my only regret was not being able to try his food – one of the most interesting items on his menu was a squid risotto – where instead of rice he uses finely chopped squid. Saturday evening we had dinner at Cicchetti – which had been taken over the previous week by Chefs Stefano & Max Colombo from Xemei (Barcelona, Spain). Cicchetti is a cozy wine bar that features Italian style tapas and cocktails – their drink menu includes several different variations of Negroni cocktails. 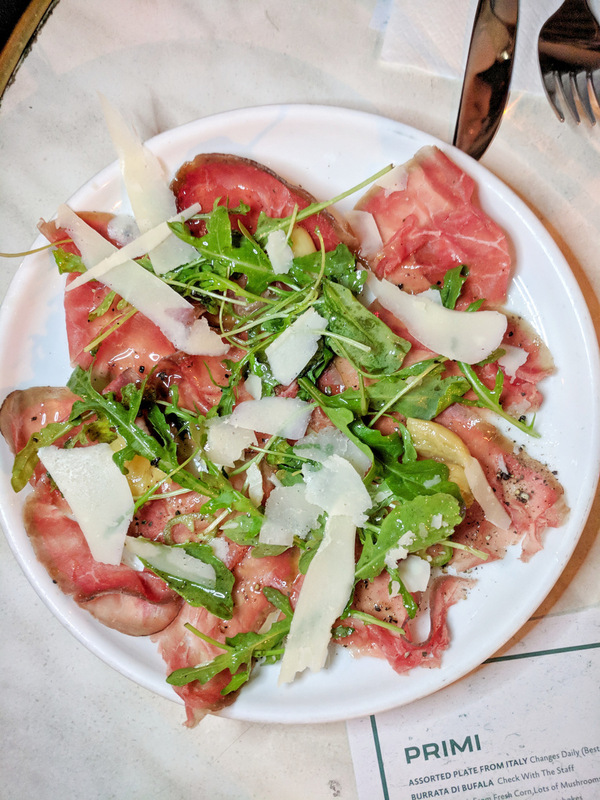 We tasted an assortment of their dishes, including the arancini risotto balls with salsa verde, beet salad, housemade bresaola with arugula, fish carpaccio with pistachios, beef pasta, and salumi pizzetta. The following day we had some free time in the morning and I met up with an old friend, Keren Brown, from Frantic Foodie, to explore Carmel Market. One of the highlights included trying a delicious burika in a pita from Haburika, also known as the Burika King. 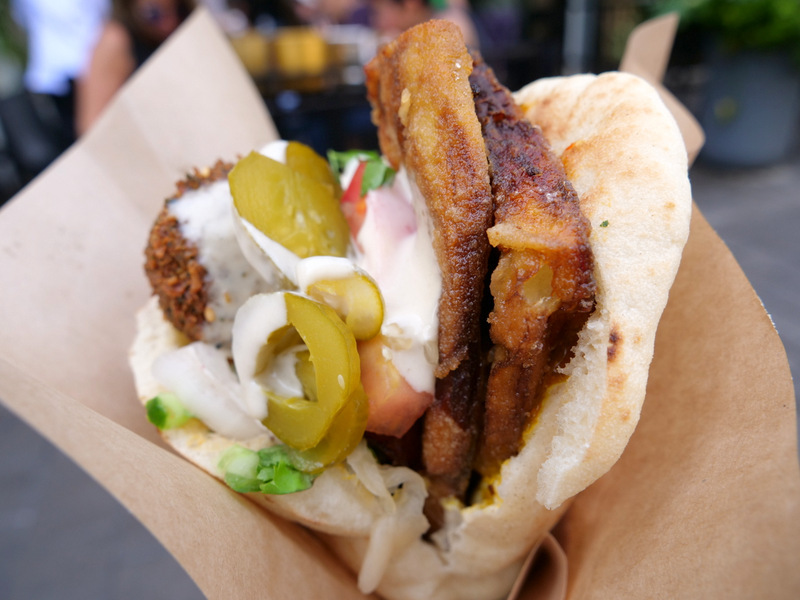 We finished by going to Falafel Hakosem for the best street food in Tel Aviv, where I tried their delicious sabich, which is an eggplant sandwich with hard-boiled egg, tahini, mango sauce, and falafel. I’m still dreaming about that sabich! Sunday night dinner was the first experience of eating at a local restaurant that was taken over by a guest chef. 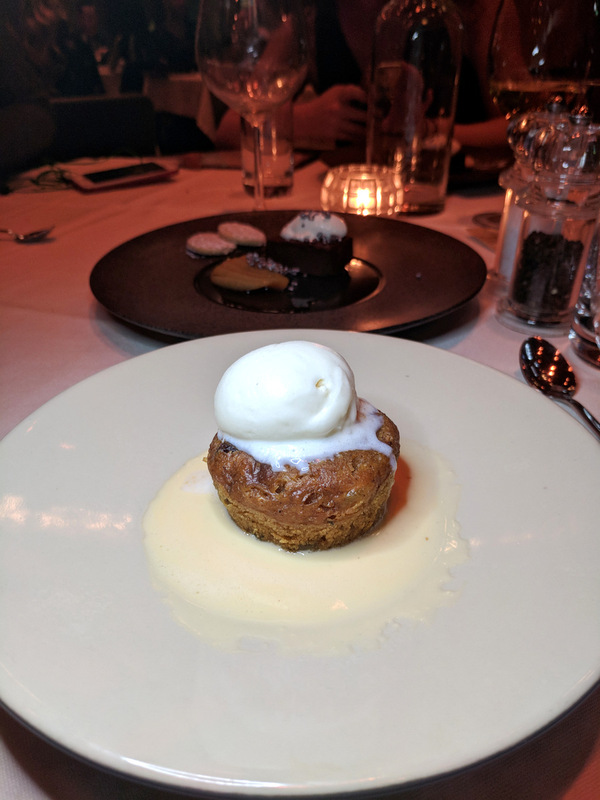 We went to Chloely’s, a modern French restaurant by Chef Victor Glover, and had a Scottish meal prepared by Chef Michael Smith from Loch Bay restaurant (Isle of Skye). We started our dinner with rustic breads served with Scottish seaweed butter – such a special and delicious flavor. Next we had a Talisker cured salmon, which was beautiful. Talisker is a single malt scotch from the Isle of Skye and is featured in some of the dishes at Loch Bay restaurant. The following course included scallops with caramelized endive, orange, and hazelnuts; plus a pearl barley risotto with cheddar that was a favorite of everyone at our table. It’s the classic example of how a simple dish can achieve perfection. We also had a comforting Scottish broth with a Tattie scone (at type of dumpling). The main courses included filet mignon with Talisker sauce, wild sea bass “McRockfeller”, and a Loch Bay “Bourride” with assorted seafood. For dessert with had a Chocolate Ganache tart made with single malt and ginger with a poached pear, and a to-die for Clootie Dumpling with the most amazing Whisky Butterscotch ice cream. 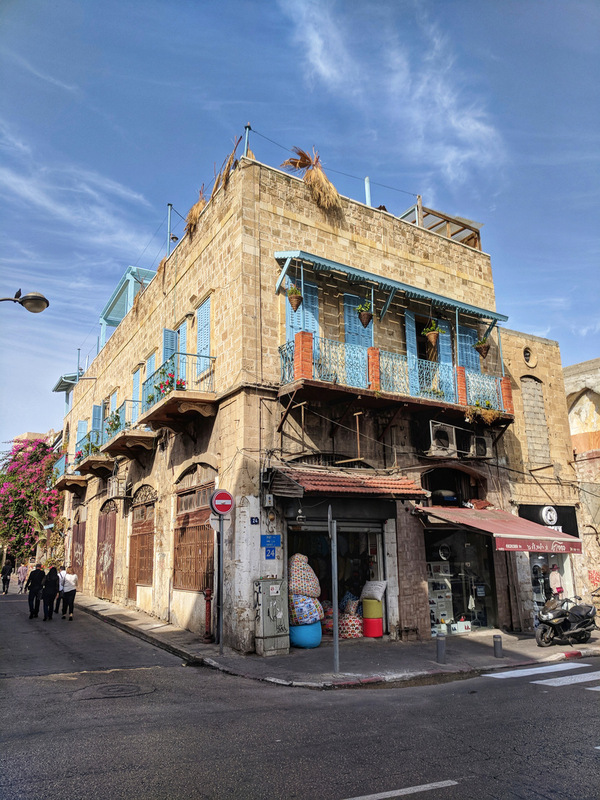 On Monday, our last day, I explored Levinsky Market, walked to Jaffa, and back through the beachfront. I love getting to know a city by simply walking through and getting lost (with some direction in mind) in its streets. 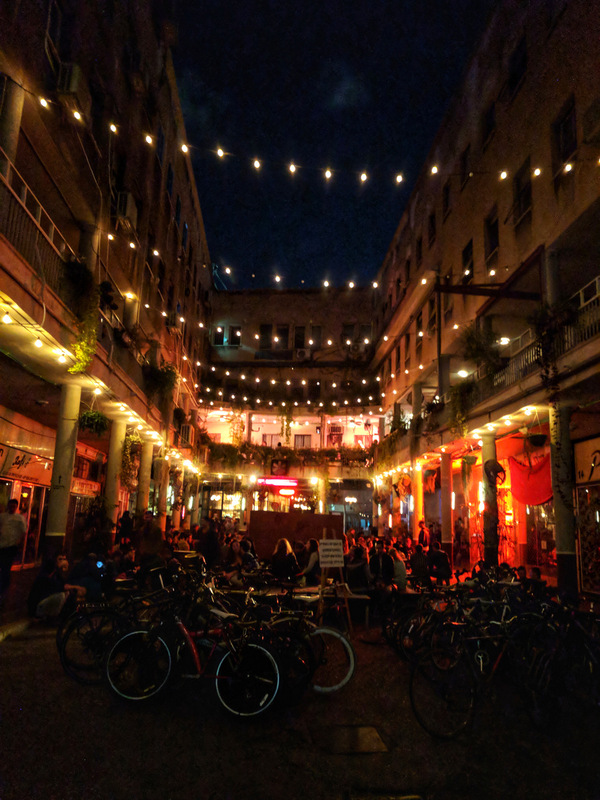 Tel Aviv is a very walkable city with distinct neighborhoods where each one has their character and special feel. That night we had dinner at local restaurant Thai At Har Sinai, which was being taken over by Chef Andy Ricker from Pok Pok (Portland/New York. It was a great meal to end this wonderful experience at the Round Tables. Chef Ricker’s menu featured dishes from Northern Thailand and some of the spice mixtures are so distinct because they are made exclusively for his restaurants by a lady in a small village in Northern Thailand. We started with green papaya fritters made with lemongrass, shallots, and dry chilies, served with a sweet chili dipping Sauce. Another appetizer was a dish of steamed salted beef sank and oyster mushrooms with a very flavorful spicy chili dip. 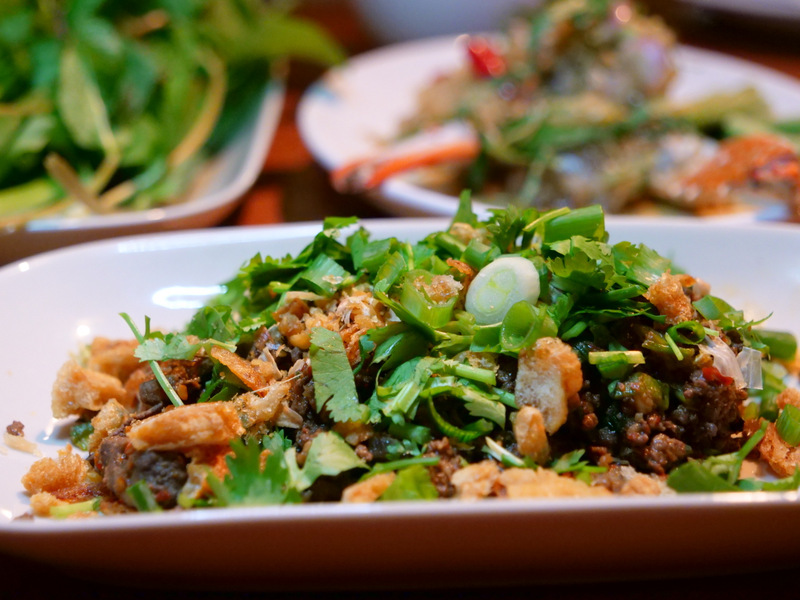 The second round included sticky rice, chicken soup with a mildly spicy and sour flavorful broth, a spicy pomelo and blue swimmer crab salad, a wonderful dish called Laap Muu Khua that consisted of minced pork dish made with offal, the special spice mixture from Thailand, pork cracklings, fried garlic and fresh herbs. 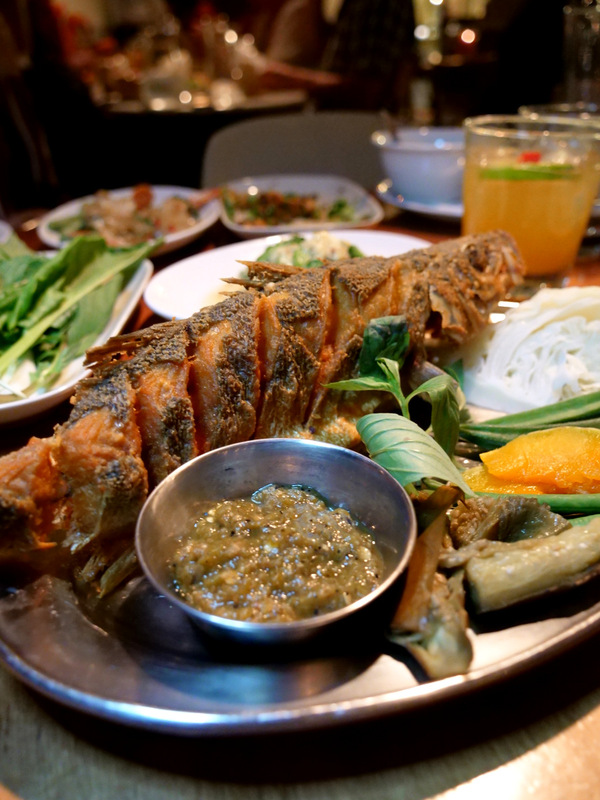 The third course included an impressive whole deep fried sea bass with a grilled green chili dip and vegetables, and bitter melon stir fry with eggs and fish sauce that has inspired me to find a great use for all those bitter melons I get in my CSA basket. We finished with one of the most interesting desserts I’ve had: durian custard served on sweet black sticky rice with coconut cream and sesame seeds. This was another wonderful experience in Israel and I would like to thank all who made this trip possible, especially everyone at Vibe Israel, the organizers of the Round Table Tour, and all the chefs and restaurants that shared their delicious food with us. Thank you! תודה!